“Space bug” prototypes (Credits: V. Djakov). Thanks to ideas of putting swarms of tiny robot bugs to work on a future space station, patients being medicated for blood clots may soon get a simple, home-use testing kit, here on Earth. Fifteen years ago as a graduate student, Vladislav Djakov started building these micro-electromechanical creatures that mimic the swarms of bugs found in nature. Equipped with a power supply, limited intelligence and monitoring systems, the bugs would be small enough to send en masse to hard-to-reach places, like pipes carrying liquids on space stations. There, monitoring changes in temperature or flow could warn of impending malfunctions. To move the bugs, the scientist hit on using cilia-like motion, much like some deep-sea creatures use to propel themselves. They covered one face of the microchip with tiny cantilever arms. “They would then move along on these like millipedes,” said Dr Djakov, now Director of Sensor Development at Microvisk Technologies. In the end, the space bugs were ahead of their time: they haven’t yet progressed past the testing phase. But the cilia approach – the cantilever arms to propel the bugs – has gone further. 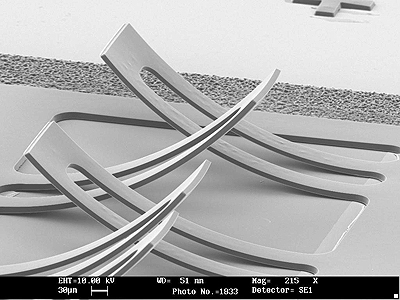 Microvisk’s cilia-like micro-cantilevers (Credits: V.Djakov). STFC Innovation, ESA’s Technology Transfer Programme partner that operates the agency’s Business Incubation Centre Harwell in the UK, saw the business potential in the medical market and supported start-up company Microvisk to spin off the technology. 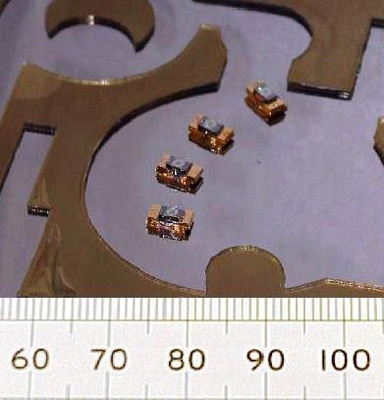 At Microvisk, Dr Djakov’s team stripped down the microchips and put the intelligent sensing mechanisms right into the cantilever arms, almost like a cat’s whiskers. These whiskers turned out to be very good at monitoring liquids. Sweeping through, they note changes in viscosity and register if anything is suspended in the liquid. “This is very interesting for probing blood, plasma, and other bodily fluids,” said Dr Djakov. At present, investors are betting on a device to monitor blood coagulation for patients taking blood thinner medication: “It’s like a diabetes test, but for thrombosis.” Thanks to this coagulometer, the Microvisk CoagLite, patients will soon be able to test themselves at home with the prick of a finger. After a small chamber inside the test strip fills with blood, the tiny cantilever sweeps the drop, monitoring how quickly it coagulates.